Subtitled “Kei II”, Akira Volume 5 is the fifth collected edition of AKIRA, an awesome and exciting manga series by Katsuhiro Otomo. 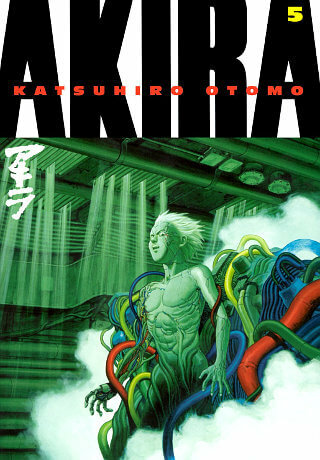 The series, especially since the release of the animated film adaptation, has put Otomo among top Japanese manga authors (mangaka). AKIRA series was originally released as serials. The collected editions of the series were first released in 1987 and its success was followed by the English version which was release by Epic Comics and later by Dark Horse Comics. Akira Volume 5 “Kei II” picks up the story left by its prequel, “Kei I”. Neo-Tokyo was heavily ruined after Akira’s power was roused. People were struggling to survive and find some accommodation to stay alive. The Great Tokyo Empire, led by Tetsuo who used Akira as figurehead, firmly established their reign and would crush anybody opposing them, such as the faction of Lady Miyako. Tutsuo, having learned his and Akira’s past and no longer addicted to government pills, improved his psychic ability. His power grew even stronger and he started to change into something fierce. Tetsuo feared nothing and nobody. He even attacked the international force who conducted an inspection on the psychic events in Neo-Tokyo. Single-handedly, Tetsuo launched assaults on American aircraft carrier battleship against a fleet of fighter jets. After his disappearance in the explosion that destroyed Neo-Tokyo, Kaneda returned and reunited with Kei and his old buddy Kaisuke. Seeing what had been done by the forces of Great Tokyo Empire, Kaneda decided to take down Tetsuo. Reuniting the surviving members of the old gangs, Kaneda assembled his own army of motorcycle riders and designed an attack on the Great Tokyo Empire. Meanwhile, Kei was recovering from the injury she got earlier under the care of Lady Miyako. With the surviving Espers who looked for protection in her base, Lady Miyako planned something to fight Tetsuo’s power. The plan required Kei to put her life on the line by being the medium for the psychic power of Lady Miyako and the Espers. Kei would challenge the all-powerful Tetsuo. In the 21st century, the once-glittering Neo-Tokyo lies in ruins, leveled in minutes by the infinite power of the child psychic giant, Akira. Now a wasteland of rubble and anarchy, the Great Tokyo Empire rises, a ragtag group of zealots and crazies who worship and fear Akira and his mad prime minister, Tetsuo, an angry teen with immense powers of his own–and equally immense twisted ambitions. The planet at large is not taking the threat lying down, however, and the might of the world is ready to take on the Empire, but will technology’s most advanced weaponry be enough to destroy Akira–and is Tetsuo an ever greater threat? The fifth chapter in a sweeping epic of over 2000 pages, Akira vol. 5 is the penultimate act of a mind-blowing graphic-novel masterpiece of awe-inspiring imagination and gut-wrenching power, and the inspiration for the classic Akira animated film. One of the Best Manga Science Fiction Ever Published. If there is one thing when it comes to anime, people will always remember Akira. When it comes to manga, this is a one read people should invested on. I love Akira personally because of its sheer epic story of man versus Godhood and any thing that writes about power, this is the book people of all reader types should read.